← Can I really get a true anodic hardcoat that exhibits vivid, crisp and true color? Selecting the right Anodizing Rack designs for Anodizing that Produce Better Results : From Jack Tetrault, President of Sanford Process Co.
It’s probable that you have never given any thought to the material or the design of the tool that your aluminum part will be racked on for anodizing or hardcoat; and for many of you, that’s fine. 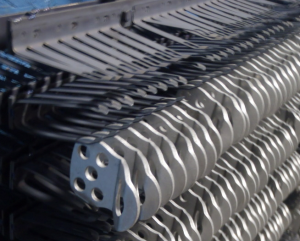 However, since a well-designed rack can cut your anodizing lead-time, lower your finishing cost, and provide for higher and more consistent quality, it is something that should be considered. When is it appropriate to design a part specific rack you ask? The answers are more complex than can fully be addressed here but if you process the same parts over and over, are concerned with cost and quality, or you want specific and well placed racking, specialized tools may be the answer. High volume is NOT the only reason to consider specialized racks but is certainly a reason as well. I have worked with many customers to design racks that specifically address concerns they have about their parts regardless of volume. Usually, specialized racks means titanium racks. Titanium racks have long life because they are not consumed by the chemistry and they do not need stripping after anodize. They can be specially designed with a variety of fingers, clips, and other contact points, and be sized to maximize the volume of parts that can fit in a tank. They can also be designed to hold the part for superior rinsing and drainage, and protect the part from damage during travel. Consequently, a well designed rack is an effective way to improve process capability (ie, better quality), lower finishing costs by increasing tank utilization and avoid stripping requirements, and produce faster turn times by maximizing loads while designing the tooling for quick racking and unracking. The issue is that these titanium racks for anodizing can be very expensive given the cost of the material and the specialized cutting and welding processes to construct them. Generally speaking the pay back period of a titanium rack is about [500 uses]. The lead-time for a titanium rack is usually about 8 weeks after the design is finalized so the use of titanium racks requires a bit of planning as well. On the other hand an aluminum rack is relatively cheap, are easily assembled and disassembled, and can be quickly designed to accommodate a great variety of part shapes and sizes. The lead-time of an aluminum rack is usually a day or so as a full service anodizer should have some capability to produce racks in-house on short notice. Lastly aluminum is a more conductive material than titanium that allows more current to flow through the same contact area. This is especially important for hard coat where the current can be up to 60 Amps per square foot. On the downside, while flexible and quick to organize, aluminum racks are seldom a perfect fit for the part but rather adjusted or adapted to the piece. While aluminum is less expensive than titanium, it is not cheap, and aluminum racks must be stripped after each anodize cycle because they become coated along with your parts. (A coated rack has much higher electrical resistance that makes it unsuitable as tooling.) Further the rack loses material and strength after each stripping process. This usually shows up first in the fingers or clips that end up not holding the part tightly. Typically an aluminum rack isn’t used more than 5 times for anodizing after which the tooling is discarded. Apart from the cumulative rack cost, there is also the issue of the time it takes to strip the rack. In addition, since aluminum racks are not specialized to maximize production quantities, turn times can be longer than optimal even if there only moderate part volumes. The purchase of tooling is always done in conjunction with the metal finisher who will coat your parts. The reason is that the tooling should maximize tank production that is dependent on both the tank size and the capacity of the rectifier used to drive the anodizing process. Secondly, the metal finisher will need to work with you to understand where the part can be racked to accommodate both the part weight, overall part surface area, and electrical contact requirements. Lastly, the metal finisher needs to think about the orientation of the part to make sure that there are no cavities that will form air pockets, can’t be drained, or doesn’t allow for complete rinsing. This entry was posted in Aluminum Anodizing - Type II, Aluminum Anodizing - Type III, Anodizing Racks and tagged Anodizing Rack Designs, Anodizing Rack Parts; Aluminum Anodizing, Anodizing Racks, Anodizing Tooling, Titanium Anodizing Racks. Bookmark the permalink.